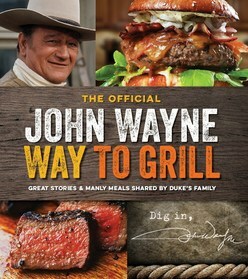 John Wayne Enterprises is proud to present The John Wayne Way to Grill, a new cookbook containing more than 200-pages of Duke's favourite meals, from Tex-Mex classics to the best of Western barbecue and everything in between. More than just a collection of recipes, this deluxe publication will be chock-full of never-before-seen photos of the actor, along with personal anecdotes and heartwarming stories shared by his son Ethan. A man is what he eats, and readers can expect to discover not only what America's most enduring icon loved to chow down on—from the perfect charbroiled burger to his smoldering and spicy baby back ribs—but the essence of what made him a legend. It's more than a cookbook. It's a guide to making you the ultimate man. John Wayne is an American Icon like no other. People try to identify with his lifestyle and this is the first grilling book that addresses that need.